Dating back to the launch of the M3 in 1954, the Leica M System has a distinguished history and reputation for quality engineering that makes it the discerning professionals’ camera of choice. Diminutive dimensions, minimalist design, and a rangefinder style viewfinder that allows the photographer to take in their surroundings and capture the decisive moment, as a scene unfolds is perfect for discreet photojournalism and street photography. Launched in 2006, the M8 was the first digital version featuring a 10Mp 27x18mm CCD. The first full frame M9 came along in September 2009 with a higher resolution 18Mp 24x36mm CCD and a $7000 price tag. The cheaper but similar $5450 M9-P followed in January 2011, with the most recent $5450 M-E Type 220, launched in September 2012. Opting for simplicity over technological gimmicks, Leica’s are stripped back to the basics with dials for Shutter Speed and Drive Mode, Apertures set via the lens, and limited controls on the rear, but of course compatibility with almost all Leica M Mount lenses. Side by side with the latest DSLRs however, the specs are nothing to shout about with a 160–2500 ISO range, 2fps burst shooting, 2.5 inch 230k dot LCD, no pop-up flash and manual focusing. So does the Image Quality on the M9-P and M-E Type 220 fare any better? The DxOMark Sensor Scores will tell us. Featuring the same 18-Megapixel 24x36mm CCD sensor the Leica M9, M9-P and M-E Type 220 achieve very similar results in the DxOMark Sensor Scores. 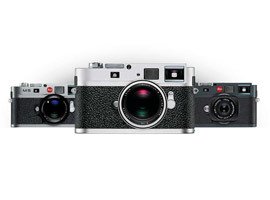 Since the M9, all digital Leica M cameras have utilized a similar 18Mp 24x36mm CCD sensor that have produced very similar results in the DxOMark Sensor Scores. With a DxOMark Overall Score of 69, the Leica M-E Type 220 ranks in a lowly 61st place overall for all sensors on the database, just ahead of the Leica M9-P in 64th place with 68 points. For cameras featuring a large sensor, this is poor and places them virtually at the bottom of our database for full frame sensors – only ahead of the 10-year-old Canon EOS 1Ds with 63 points. Put it into further context of many current full-frame DSLRs scoring well over 80 points and recent Nikon offerings like the D800E boasting a massive 96 points, the M9-P and M-E Type 220 are well off the pace, with the D800E offering almost 2-Stops better image quality overall. The trend continues in the Portrait (Color Depth) category, where scores of 22.7 bits for the M-E Type 220, and 22.5 bits for the M9-P, ranks them 75th and 77th overall and again second to last for full frame sensors. Things slightly improve with Landscape (Dynamic Range) Scores, where 11.6Evs and 11.7Evs elevates them slightly to 71st and 73rd place overall, but it’s the Sports (Low-Light ISO) Score where the Leica’s CCD sensor is so disappointing. Scoring 854 ISO for the M9-P and 787 ISO for the M-E Type 220, the Sports Score results rank these Leica cameras the worst 2 full frame sensors on the DxOMark database. With a DxOMark Overall Score of 68 points, the Leica M9-P ranks in 64th place for all sensors and second to bottom for full frame sensors, only ahead of the 10-year-old Canon EOS 1Ds with 63 points. In terms of image quality, 69 points sandwiches the Leica M-E Type 220 in between the consumer orientated Samsung NX200 and Sony NEX 5 Hybrid cameras that use a physically smaller APS-C Sensor. The worst sensor scores from the Leica M9-P and M-E Type 220 rangefinder cameras are their Sports (Low-Light ISO) results, which with 854 ISO and 787 ISO respectively places them bottom for full frame sensors. At base ISO 11.7Evs of Dynamic Range is recorded, but this drops off quickly and above ISO 400 Scores fall below the 10Evs threshold for good Dynamic Range, limiting the Leica’s use in low-light environments. Color Sensitivity holds up slightly better on the M-E Type 220 and M9-P with good color up to ISO 800 offering around a ½ Stop improvement over the M9, although the latter is a tad better at ISO 3200. Overall Scores for the Leica M-E Type 220 are notably worse in all categories compared to the top of the range Canon and Nikon DSLRs that sit in a similar price bracket. Yes, they are VERY different cameras, and no one is suggesting any sports photographer will consider buying a Leica M-E Type 220 (although we bet a fair few photojournalists own a D4 or 1Dx), but occupying the same price bracket comparisons do become relevant. We’ve seen the Leica’s CCD can’t compete with the DxOMark Overall Scores from the latest evolution of CMOS Sensors, but drill down further and differences become starker as the M-E Type 220 continues to struggle at high ISOs. Color Depth of 24.7 bits (D4) vs. 23.8 bits (EOS 1Dx) vs. 22.7 bits (M-E Type 220) equates to a 1 1/3rd of a Stop improvement for the D4 over the M9, and 2/3rds of a Stop for the 1Dx. As the best Portrait Score is usually achieved at the lowest ISO, value Canon and Nikon are at an immediate advantage with Measured ISO values of 80 and 75, respectively compared to 145 ISO on the M-E Type 220. Results on the Leica drop off steeply, however and while great Color is achievable at the Manufacturer ISO 640 on the M9, the 1Dx keeps going up to ISO 1600 and the D4 up to ISO 3200. A more exaggerated result occurs with Dynamic Range, too. The M-E Type 220 starts at a respectable 11.7Evs at ISO 145, the same as the1Dx at ISO 80, but then quickly falls away and by Manufacturer ISO 640 the Leica has dipped below the 10Evs threshold for good Dynamic Range. The D4 and 1Dx don’t drop to that level until manufacturer ISO 6400, however and boasting greater sensitivity latitude these models produce comparable Dynamic Range at ISO 25600 compared to ISO 2560 on the M-E Type 220. At base ISO sensitivity the D4 and 1Dx offer 1 1/3rd and 2/3rds Stop better color respectively. While good color on the M-E Type 220 tails off at ISO 640 similar results are achieved at ISO 1600 on the 1Dx and ISO 3200 on the D4. Dynamic Range on the M-E Type 220 drops off even more rapidly. Despite a comparable score to the 1Dx of 11.7Evs at ISO 145 by ISO 2500 the M-E 220’s Dynamic Range is 2 Stops worse than the Canon and Nikon DSLRs. The Leica M-E Type 220’s CCD Sensor can’t compete against cheaper Nikon and Canon DSLR image quality and especially not against the D800 which offers nearly 2 Stops better Image Quality overall. Results don’t improve for the Leica’s when they’re pitted against cheaper full frame DSLRs, like the $3499 Canon EOS 5D MKIII or the $2797 Nikon D800 either. Compared to the EOS 5D MKIII, like we saw with the 1Dx, Dynamic Range results at the base ISO are the same at 11.7Evs. But with a Portrait Score of 24 bits against 22.7 bits on the M-E Type 220, the Leica is almost 1 Stop worse. Again, it’s the low-light capabilities of the Leica which are more relevant, however and with a Sports Score of just 787 ISO on the M-E Type 220 the Canon offers an extra 1½ Stops with a score of 2293 ISO. The Nikon D800 is just in a different league altogether though. A DxOMark Overall Score of 95 compared to 69 equates to nearly 2 Stops better image quality overall, a result which is replicated in each of the three individual categories. At base ISO the M-E Type 220 scores similar to the 5D MKIII with 11.7Evs. The D800 is way ahead with 14.3 Evs and the Nikon has the same Dynamic Range at ISO 25600 as the Leica at its max sensitivity of ISO 2500. At all ISO values up to the M-E Type 220’s max sensitivity of ISO 2500 the Leica has poorer SNR Scores than the 5D MKIII and the D800, which also offer greater latitude up to ISO 25600 and ISO 102400 respectively. The 24x36mm full frame CCD sensor utilized in the Leica M Series rangefinder cameras produce significantly poorer raw image quality, compared to results from DSLRs featuring a CMOS alternative. It’s fair to say too these results purely examine the data from the sensor, excluding the impact top quality Leica M Mount glass will have on the real world results. At base ISO sensitivities Dynamic Range and Color Depth scores aren’t quite as far away from competition, like the Canon EOS 1Dx and 5D MKIII, as the DxOMark Overall Scores might suggest. Compared to the evolution of CMOS sensors used in the latest Nikon and Sony DSLRs however, the DxOMark Scores indicate a gulf in image quality, not only at base ISO but importantly at mid range sensitivities up to ISO 1600. While image quality drops off very quickly on digital Leica M cameras as you increase the ISO, the top-end DSLR competition keep delivering the goods at staggeringly high sensitivities. We will now have to wait and see if the new and much anticipated Leica M Typ 240, sporting a new 24Mp CMOS sensor, addresses this problem and puts Leica back in the digital camera game.